Preheat oven to 200°C (400°F). Using a small sharp knife, cut the sweet potato three-quarters of the way through at 3mm intervals. Place on a lightly greased large oven tray lined with non-stick baking paper. Drizzle the sweet potato with oil and sprinkle with salt and pepper. Cook for 40–45 minutes or until tender. Sprinkle with parmesan and cook for a further 5–10 minutes or until golden brown. To make the basil salsa verde, place the basil, parsley, chives, garlic, oil, lemon juice and salt in a small food processor and process until finely chopped. 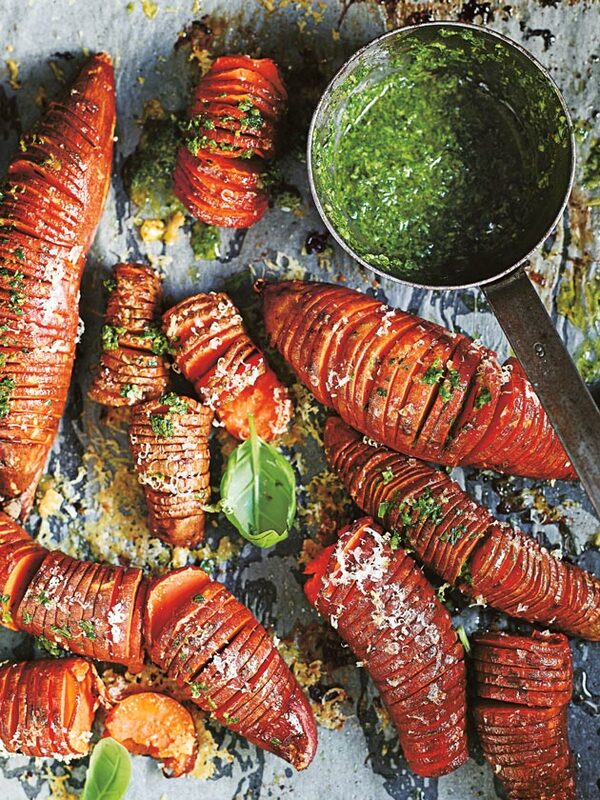 Top the sweet potato with the salsa verde and extra basil leaves to serve. Serves 4.